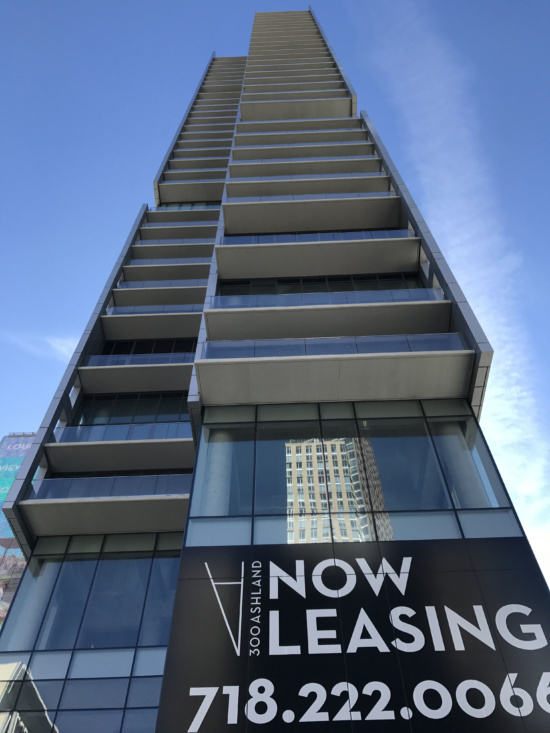 Though it might be easy to mistake 300 Ashland for another trendy tower dotting the Brooklyn skyline, upon closer inspection it’s anything but ordinary. The sensitivity and vision of its design is remarkable, particularly when it comes to the way the tower interacts with its surroundings. 300 Ashland is centrally located at a unique triangular intersection in the heart of the Downtown Brooklyn Cultural District, at the intersection of Flatbush, Ashland, and Lafayette Avenues. The mixed-use building will feature 379 apartment units, first floor retail space, and will also become the new home of a number of cultural tenants, including MoCADA, Brooklyn Academy of Music cinemas, and a new branch of the Brooklyn Public Library. 50,000 square feet of performance, gallery, archive, and program space will be integrated into the building for these organizations, effectively extending the BAM campus and creating a cultural hub for the community. This is part of the reason that the architects view 300 Ashland as a civic proposal, despite it being a residential building. As such, much attention was given to the way the building interacts with the street and the community. 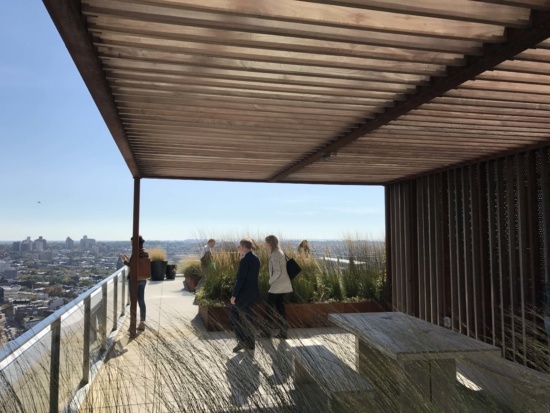 The success of the project relies on TEN Arquitectos‘ belief that all architecture is on some level public, regardless of program, and the architects prioritized the creation of public space around the project. The result is an open, inviting, terraced public plaza that acts as a civic space and welcoming area for visitors to the cultural organizations within. 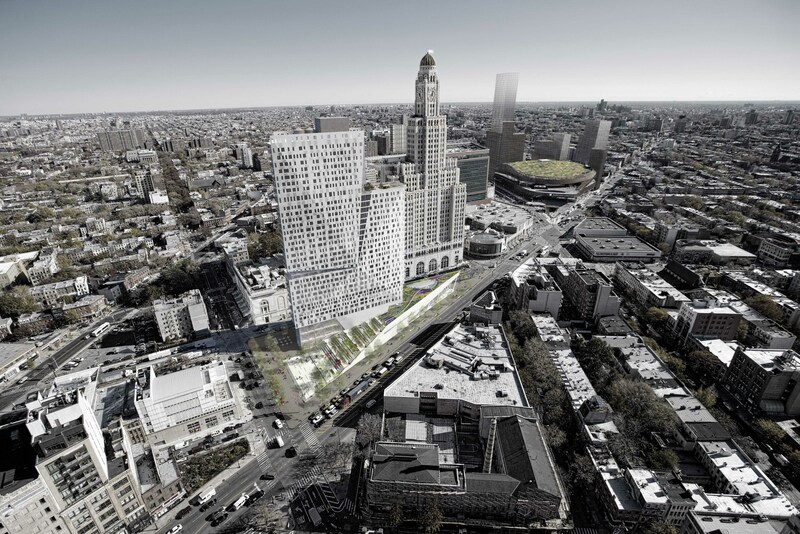 As Andrea Steele of TEN Arquitectos explained, “We could have built to the property line, which is the street, and we could have made the tower taller.” Yet instead of maximizing square footage, the architects worked with the developer to “give a piece of this project back to Brooklyn.” And by designing to take up less of the overall site footprint, 15,000 square feet were indeed given back to the city in the form of public space. Of course, the architects acknowledged that the project is a business and needs to make money—and with a clever tweak that moves the cultural spaces to the second floor while preserving street level entrances, the space for retail was maximized. At the time of its conception 14 years ago, there were no other towers in the area; the iconic Barclays Center had not even yet been planned. What was there, of course, was the historic 1 Hanson Place, better known to most as the Williamsburg Savings Bank tower. Since the historic tower was completed just prior to the Great Depression, it stood alone for more than half a century in an area that had been planned to support large–scale building projects. 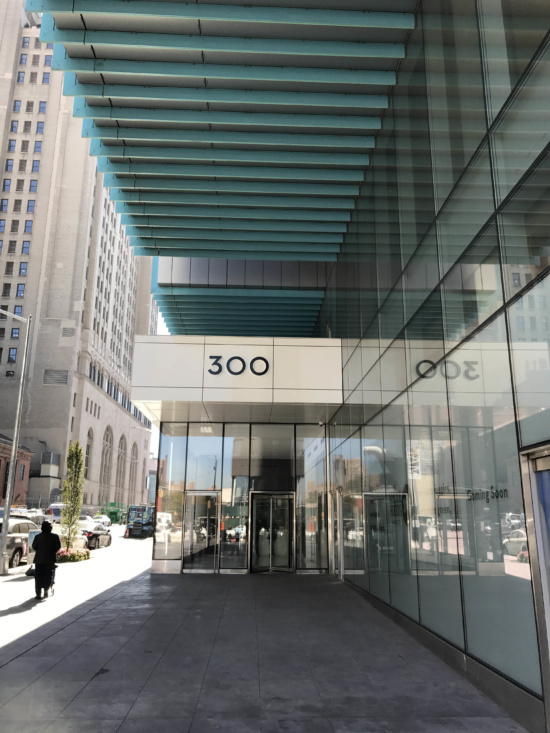 For TEN Arquitectos, respecting that building and its residents became a driving force behind the design of 300 Ashland. 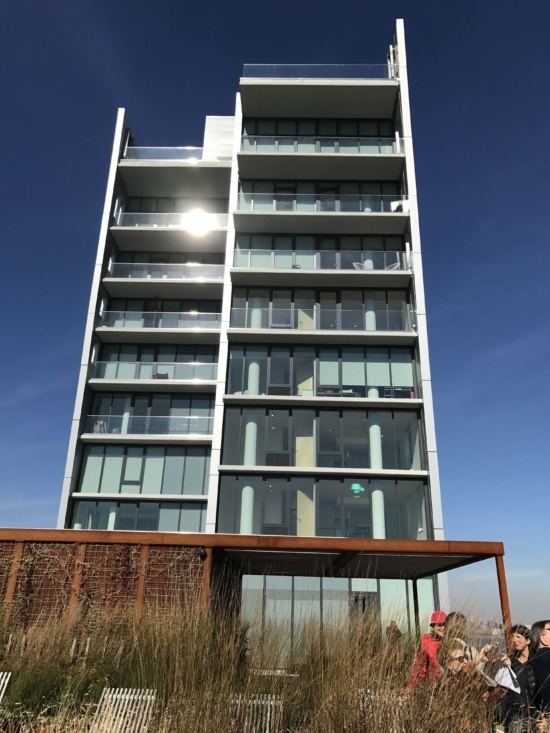 The façade shifts back to not only provide an additional terrace, but in doing so preserves the uninterrupted view corridor of the historic tower. 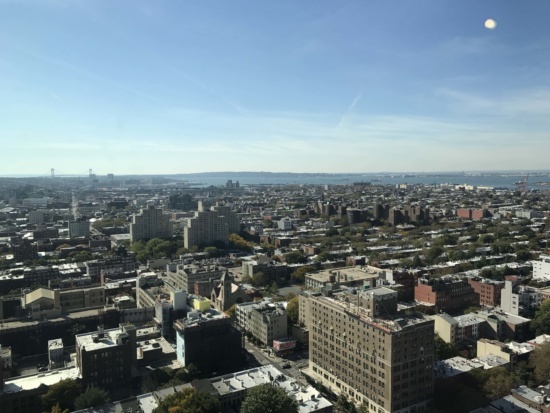 Archtober did tour some of the small but bright and immaculately finished apartments, and take in some of the incredible views from the tower’s 33rd floor. 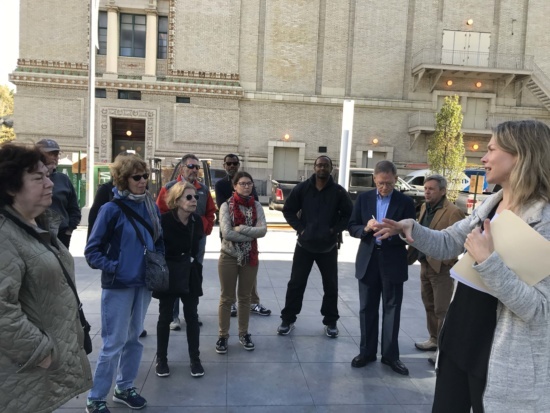 We may not all be able to live there, but thanks to an inviting plaza and cutting–edge cultural space integrated in the project, we can all enjoy a piece of 300 Ashland. Join us Sunday at the Morris Jumel Mansion!